The beauty of Austria is awe-inspiring. With flower filled meadows on the valley floor, sparkling blue lakes and snow-capped mountains, it is a paradise for cyclists of all abilities and offers hundreds of miles of well-marked, inviting trails through some of the most pristine natural environments in Europe. 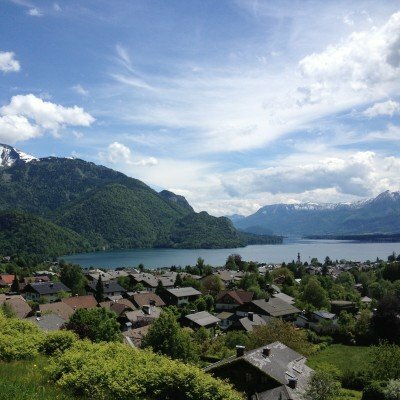 Our single-centre activity holiday incorporating both cycling and walking is based in the Salzkammergut area (the Lake District) of Austria, an impressive region boasting 76 lakes and a stunning mountain back drop. Ideal for families, stay in a luxury 4-star hotel - with top of the range wellness centre - and choose from a whole host of activities: walking, cycling (route notes for both provided), water sports, boat trips, ice caves. Complimentary Headwater bikes included for the duration of your stay. Stay in a luxury **** hotel - with top-of-the-range wellness centre - and choose from a whole host of activities: walking, cycling (route notes for both provided), water sports, boat trips, ice caves. Complimentary Headwater bikes included for the duration of your stay.